Legendary tier members can get this RTS/god game hybrid throughout July. 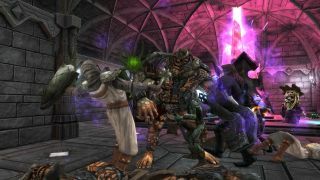 This month, members of the PC Gamer Club's Legendary tier get a key for War for the Overworld sent to their inboxes. We’ve teamed up with our games partner Fanatical.com and Brightrock Games to offer members this indie strategy title, which usually retails for $30/£23 on Steam. Join today and you'll get a copy. War for the Overworld is a dungeon management game that evokes the likes of Dungeon Keeper—the developers call it a cross between an RTS and a god game. If you enjoy the base game, its latest expansion was The Under Games, which came out in April. We covered the details of that a couple of months ago. The PC Gamer Club Legendary tier costs just $4.99 a month, and with that you get access to exclusive in-game items, our monthly magazine, an ad-free version of the site and a members-only Discord channel. You help support our editorial work on PCGamer.com, too, which is greatly appreciated. Plus there's an official Tub Geralt wallpaper, available for all monitor sizes. Fanatical is hosting its Red Hot sale at the moment, and we rounded up some of the best deals here. Excavate and build your dungeon beneath the overworld, in the modern dungeon management game that’s most faithful to the genre’s original DNA. Evil loves options, and within the Veins of Evil there are plenty to go around. Choose from over sixty rooms, spells, potions, rituals, traps and constructs! Conquer your enemies in your own unique way! Choose from Campaign, Skirmish, Scenarios, Multiplayer, Survival, and the My Pet Dungeon expansion (free demo in the base game). Build your own maps and campaigns with the powerful Map Editor, complete with scripting support. Share them on the Steam Workshop and join the thousands already created! War for the Overworld is developed by an independent team of fanatical developers. We’ve continued to update the game since launch, with countless patches, polish and new features."